There are times we might need to use a different map other than the one we Unwrapped. In the example below, we have an Inbound 850 Purchase Order for Mills Fleet Farms with BEG02 = ‘00′ (ORIGINAL) and BEG02 = ‘01′ (CANCELLATION). We want to use a different map for ORIGINAL versus CANCELLATION. 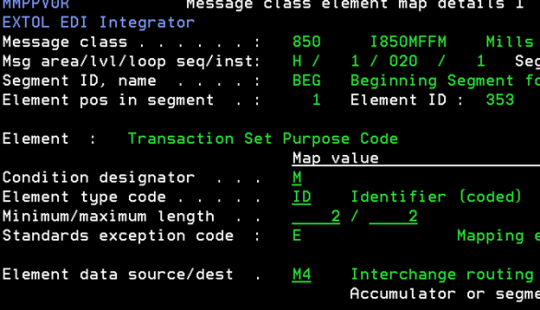 Below we assign M4 to the BEG01 element in Cleo/EXTOL Integrator. After we assign the Code Table: MFFM850AUT to the BEG01 element, we assign specific inbound 850 maps to each type of BEG01 elements we might receive.